Will it work as well as we were promised? 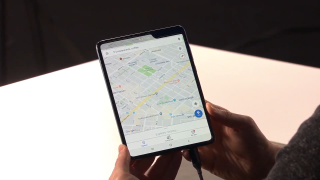 When the Samsung Galaxy Fold was launched by Samsung on February 20 it looked every inch the phone of the future: apps could be quickly transferred between the outer and inner screens, and a tablet-sized device could easily fold down to become a phone. However, someone has managed to get their hands on the phone, and not all may be as it seems. An early user of the Galaxy Fold, speaking to SamMobile, described their experience with the phone – and it didn’t sound like the revolutionary experience you’d expect of a $1,980 / £1,799 (roughly AU$2,800) handset. It’s not clear how they got hold of the device – they could be an analyst, a tester, or a developer trying to tailor apps to the handset. What did we think of the Samsung Galaxy S10 Plus? Are 5G phones the real phones of the future? One notable takeaway from their experience is that there’s a delay when apps switch between phone mode and tablet mode – when you open the device, apps that were in use will take a few seconds to become available on the larger display, and often they’ll appear in small-screen mode for a few seconds after that. Samsung advertised the Galaxy Fold as offering seamless transitions between the two modes, showing off Google Maps being transferred between the screens, but this leak suggests that isn’t the case. There’s still a month until the device launches, so Samsung has time to fix this issue, but right now, if this source is to be believed it sounds like Samsung’s phone of the future may be rather sluggish. Another important piece of information from the leak is that the Galaxy Fold doesn’t flatten completely – when closed, there’s a gap by the crease, similar to when paper is folded but not flattened. This doesn’t seem like a deal-breaker, and likely reduces the prominence of the crease when the device is open, but it also makes the Galaxy Fold seem a little more delicate when closed. The Galaxy Fold user did mention how visible the crease is when the Galaxy Fold is open, saying that above 70% screen brightness the crease is barely noticeable – the bigger issue we’ve heard about regarding the crease is that it will only survive about 10,000 folds, or 27 times a day over a year, before it becomes visible on the opened screen, but according to this leak the crease can be seen on new devices too. Many of the leaks we’ve seen surrounding the Samsung Galaxy Fold are negative, pointing out various problems it has or ways it can break, but we’d expect Samsung to be working hard on addressing these issues, and there’s still a lot to be excited about when it releases, on April 26 in the US or May 3 in Europe. Either way, keep tuned to TechRadar to find out the latest news, rumors and leaks.